And in all the hundreds of conversations I had with Warren residents, there were only six responses to that question: “Roads, Blight, Crime, Drugs, Schools and Jobs.” Just those six things. Never a seventh. I felt then, and continue to feel, that these are not six separate problems. Rather, these are six symptoms of one big problem, which is the lack of growth in Warren for more than 40 years. “Lack of growth” is actually an understatement; what we have experienced is a steady, long-term, shrinking of our city. Fewer jobs led to fewer people, which led to more crime and drug use, and more and more vacant houses, more blight and less money for all city services including road repairs and school budgets. Without growth, and with tremendous effort and luck we might be able to fix one or two of the Big 6 problems, but it will always be like pushing a boulder up a steep hill. And just like King Sisyphus we are bound to watch that boulder role back down on ourselves time after time. Therefore, finding a way to restore growth to Warren is not just our biggest problem, we must treat it as our only problem. We must find a path to growth if Warren is to have a future any of us would wish for. And there isn’t much time because, contrary to what many people believe, the pace of decline in Warren is actually increasing. These statements may sound bombastic to you, therefore over the next few weeks I plan to conclusively demonstrate the scope of the problem here on Warren Expressed. I’ll be using charts generated from U.S. Census Department data and other sources to make the case. The data is compelling. 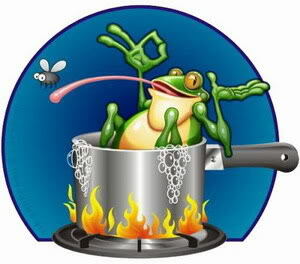 Many of us are like the frog floating happily in warm water inside a big pot, unaware that the flame under the pot is slowly being raised to the boiling point. The frog’s world is headed for an unhappy ending but he fails to notice it because the heat increase is so gradual. It’s similar for us in Warren. One more company leaves, a couple more vacant houses appear down the block, a few more pot holes to dodge on your way home. We’ve become used to it. I don’t know when the tipping point, after which recovery is not possible, will occur — but there is one. We must address and solve this existential problem or accept that in 20 years the only working stop light in Warren may be blinking forlornly at the corner of Park and Market. Posted Tuesday, March 14th, 2017 under Economic development.